Hobby Wing Seaking 120 Pro. 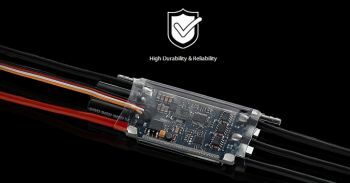 $7 off shipping and handling on any order that contains a seaking 120,160 or 180 esc. Use Coupon code Seaking. The Seaking Pro 120A is an electronic speed controller specially designed for boat racing. With the size and weight, it definitely can meet users’ requirements of a small and light product for all marine competition. Plus, its special core program features an array of programmable parameters will always allow users to have a first-class driving feel in different racing environments. Output: Continuous current 120A, burst current 760A (0.1S). Main application: Mono1, Eco and other race boats in 500- 600mm range. The whole circuit board and all the components on it have gone through nano-coating treatment, which makes the Seaking 120A splash-proof. And the built-in BEC with the maximum output of up to 8A and the voltage adjustable between 6V and 7.4V allows users to use various high torque & high voltage servos. The Reliable hardware (i.e. MOSFETs with extremely low internal resistance) combined with advanced software (features low-voltage cutoff protection, thermal protection, throttle signal loss protection, and etc.) guarantees the durability and reliability of the Seaking Pro 120A and relevant electronic devices. The Seaking Pro 120A also has the Turbo timing function (first implemented by a boat ESC), which will give users the edge over the competition with instant turbo boost. 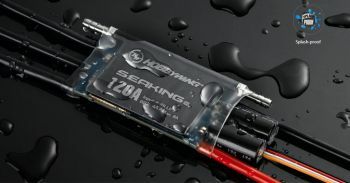 The Hobbywing patented heat-conductive copper bar cover on the power board of the ESC combined with the water cooling module efficiently and effectively transfers heat to the outside thus keeping your Seaking Pro 120A as cool as possible. Users can upgrade or program the ESC with the optional Hobbywing WiFi/USB Link software, a WiFi module/LCD program box and a smartphone/laptop. Hobbywing updates its ESC firmware regularly giving users upgraded features more often when available. Notes: This can not be programmed with the standard Seaking program box. Requires pn# ker-100pro Multifunction LCD Professional Program Box. This esc was designed to work in an environment where its possible for the esc to get wet on occasion. Not for use underwater. This item will not work submerged and it may cause damage. This esc is suggested for smaller boats upto the 27" (550mm) range. Because there are so many variables with each hull and installation its impossible to specify all the applications for this esc. If you have any questions on using this esc with your particular boat, please contact us before purchase.